For 2018 BMW continues to live up to its long-standing tradition of luxury, comfort and safety. The new 2018 BMW M550i xDrive offers plenty of features and then some. 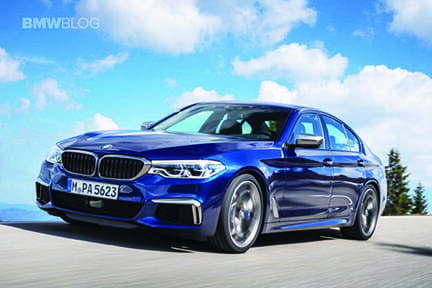 According to BMW, this model is their quickest 5-series sedan of all time. And that’s thanks to the 4.4-liter BMW M Performance TwinPower Turbo V-8, 32-valve 456-hp engine. It combines two turbochargers with variable valve control (Double-VANOS and Valvetronic) and high-precision direct injection. Luxury features for a smooth, and comfortable pleasant ride. There’s the Advanced Vehicle & Key Memory; climate-control temperature and air-distribution settings. The exterior mirror and power seat settings are audio tone settings, with radio presets; central-locking preferences; and lighting preferences. To further speak of lighting—let there be light and plenty of it thanks to the BMW Ambiance lighting. This package includes door handle-area lighting, illuminated driver and front-passenger vanity mirrors, front footwell lights, front and rear reading lights, and 11 predefined selectable interior light designs, along with ground-illuminating lights in exterior door handles. There’s also an Automatic tilt-down of passenger’s side-view mirror (when car is shifted into reverse gear) for visibility of curb when backing up. And to make an evening ride in the city or the countryside even more special, there’s the 2-way power glass moonroof with “one-touch” operation and power interior sunshade.